Crafting With Craig: A December to remember wedding card. Iv been very bad and not blogging as of late, where is the time going? Been busy with Christmas commission cards, cards for fayres & cafés. All other commission cards and Hunkydorys recent collections. Just received the next one yesterday. The ladies in Franco's cafe - where my cards are being sold, well some of the chefs is getting married next week and they ask if I would make a card, but also a box. The colour theme is cream and purple- cadburys chocolate purple. I really wanted to make it extra special. So I used my large score board from crafters companion aswell as their brand new flower die'sire die that was part of their 4 Day Deal shows last week. Could work out what topper to use so I decided on a Kanban love topper from their all occasion collection. 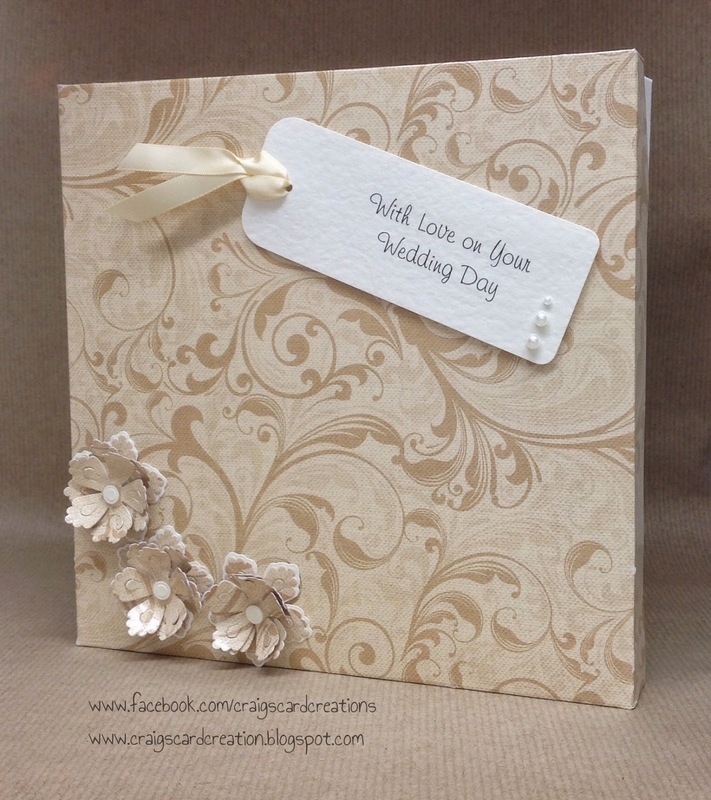 To give it extra depth and touchy-feely I used my embossing folders and my tonic studios die, adding pearls and bows to finish it off. The box was made by taken 2 pieces of 10 & 1/4 - ten and a quarter x 10 & 1/4 - ten and a quarter card stock. Then scoring at 1" all the way round. My base I used Centura pearl card stock and for the top I used the A3 elegant card stock both by Crafters Companion. I added some more flowers that I layered 3 times each, a sentiment in a tag - Done. I was so pleased with how it turned out, especially the purple and ivory/cream colour. A4 foam pad sheet 2mm - S57182. 12mmx12mmx3mm foam pads - S57041. 12mm red clear tape - S57091. Purple textured card - Bazzill Basics. Bow circle die - Tonic Studios. Lace bloom die - Craftwork Cards. Love topper (Love & Marriage Collection) - Kanban Crafts. Background paper (Love & Marriage paper pad) - Kanban Crafts. Embossing folder - Free with Ebosser. 25mm Ivory satin ribbon - American Crafts. 9mm Purple satin ribbon - American Crafts. 5mm & 3mm pearls - Hunkydory Crafts. Elegance A3 double sided card - Crafters Companion. Centura pearl A3 card with hint of silver - Crafters Companion. Large A3 scoreboard - Crafters Companion. Lace bloom die - die'sire Crafters Companion. 9mm Ivory satin ribbon - American Crafts. 5mm/3mm pearls - Hunkydory Crafts.